by Courtney Cleveland features editor One of the most anticipated times of the year has arrived, when alumni, parents, and current students all gather to celebrate one common thing: Millsaps. 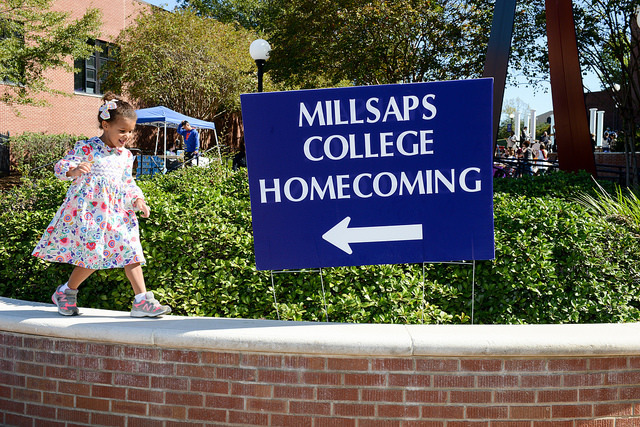 One of the most anticipated times of the year has arrived, when alumni, parents, and current students all gather to celebrate one common thing: Millsaps. Homecoming Week kicks off Tuesday, Oct. 24, with an outdoor movie night at 8 p.m. in the Bowl. Sponsored by Programming and Activities Council, Wonder Woman is the featured film and attendees have access to free snacks. Continuing Wednesday, Oct. 25, PAC is hosting a caramel apple bar from 11 a.m.-1 p.m. in the Leggett. Get there early, though, because presumably people will be excited, and the apples probably won’t last until then. On Thursday, Oct. 26, PAC is hosting a game of laser tag in Galloway Green. It begins at 7 p.m. and is free to Millsaps students. On Friday, Oct. 27, world-renowned poet, Claudia Rankine, will be present for a Friday Forum. She will be reading from her book entitled “Citizen: An American Lyric,” which current sophomore students were required to read. It begins at 1 p.m. and will be held in the Gertrude C. Ford Academic Complex Recital Hall. From 6:30-8:30, there will be a tour and viewing at the James Observatory sponsored by the Millsaps College Department of Physics. From 7:30-9 p.m. also in the recital hall, the music department will be hosting a concert featuring several Millsaps’ instrumental and vocal ensembles. There will also be solo performances by students that attend Millsaps. First place in the Plaza Ya Ya competition will receive a $200 cash prize. Beginning at 10:30 a.m., there is a Black Alumni Reception in the Lindsey Suite Dining room, which is located in the A. Boyd Campbell College Center. Alumni are invited to connect with friends and current students. Tailgating for Homecoming begins around 1 p.m. and will last until 3:30 p.m. Tickets are $20 if you’ve registered and $25 if you pay at the gate. Kickoff for the main event, the football game against Centre begins at 1 p.m. on Harper Davis Field.